​LONGVIEW – Union Pacific (UP) trains roaring through Longview at all hours rouse light sleepers and occasionally slow traffic at about 40 railroad crossings in the city. The railroad has been a major player in the Longview-area economy since the Southern Pacific Railroad began commercial rail service in 1871 as the city was being founded. The Union Pacific Railroad arrived in Longview 111 years later, after buying the Missouri Pacific, and has made Longview a major crew-change location. 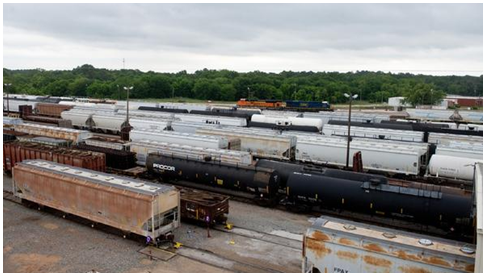 Union Pacific has earned top safety record two years in a row. Today, about 250 crew members are assigned to Longview as their home base, said Lance Stubblefield, manager of train operations-transportation for UP's southern region. They are among about 400 in Longview and 600 total who work for the railroad in and out of Longview and Marshall. Outside in the switching yard, about 50 people work on maintenance and repair of railcars. Some carry freight, some commodities, and others liquids or chemicals. ​​​Want more data? See Longview Employment Market Research.